Super fast and super light! Chromebooks are popular notebooks that run Chrome OS, a Google operating system. 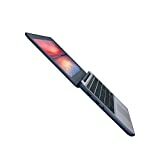 Because they store data online they need less hardware and are therefore ultra thin and light. Chances are you have decided on buying a chromebook because of the portability and the convenience the online storage offers you. Also because their operating design make operating them very fast, and are a perfect way to manage your online google office. Trying to find the right one, however, can be less than convenient. To help assist you in easily navigating your options, we have put together this shopping guide for you. 11.6 Inch Chromebooks: This are the most portable Chromebooks. Their slim design and light weight make them perfect for travelers. Small and light enough to fit into the smallest travel backpack, you download your trip pictures from the comfort of your hotel room! 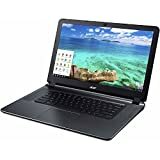 13 Inch Chromebooks: These have the portability of the 11 inch but the bigger screens and keyboards make them much more useful when you need to do more typing. Great for business and for bloggers or travelers, these lightweight notebooks will make sure you have your office, wherever you are. 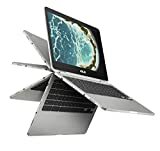 14 Inch Chromebooks: These are the largest of the Chromebooks and their larger screens make video watching or extended computer working much more comfortable. With slightly more meat to them, they give you more options for travel, business and home use. Battery life: Because most Chromebook reviewers value the portability of these notebooks, battery life is important. Chromebooks that offer a longer battery life provide better user satisfaction. Check the model specs for expected battery life before buying your chromebook to make sure it meets your needs. Speeds: Chromebooks that are fast to start up and fast to operate are rated much higher by users. Things like responsive trackpads will also make your new Chromebook efficient. Speakers: Reviewers rate sound quality of their Chromebooks as highly important. Because chromebooks are designed to be used out of the office and home, you won’t always have access to external speakers. Good sound means quality business calls, video watching and great presentations and checking the specs will avoid disappointment. Chrome OS and storage: Chromebooks are operated by Chrome OS and are designed to work seamlessly with your Google drive. If you are looking for a computer to run your complex design programs with big internal memories, then this may not be the computer for you. Reviewers find Google docs and apps easy to use and enjoy the cloud storage but consider your storage needs before purchasing. A lot of brands offer additional storage which will mean more space and more product satisfaction. When deciding on your Chromebook, consider your intended use. For travelling, the 11 inch is your best option. If you spend more of the day out of the office or on the go and need something light and portable, then the 13 inch is for you. Need a more substantial notebook for those projects or to stream your favorite shows? Then the 14 Inch is for you. Choosing a Chromebook with an HDMI port will let you connect to your HD TV or projector for that great movie experience. 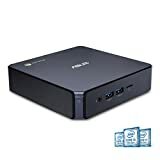 Chromebooks typically come with either 3.0 or 2.0 USB ports, which allow you to connect your hard drive or other storage to your notebook. 2.0 USB ports are more cost effective, and 3.0 USB ports offer faster data transfer speeds. Because you have online storage, you do not need as much RAM (memory) as other laptops. If you plan on running a lot of programs or apps, then 4g or above will be more suited to you. With your new Chromebook, you will receive 15 GB (gigabytes) for you to store your files on your Google drive. Most Chromebooks should come with a coupon offering additional storage for a further two years. Before you buy your Chromebook, consider your storage. They will have 64GB, 32GB or 16GB of internal storage. To save money on buying more online storage, choose one with more space or something with an SD card slot for extra storage. Add a 3/4G data plan to your Chromebook purchase and you will always be online no matter where you are! Some of these notebooks have the added benefit of free 3G or 4G data connection or free Gogo inflight internet passes. If you are going to do a lot of typing, consider both the quality and size of the keyboard. 14 inch Chromebooks have bigger, more comfortable keyboards. Your Chromebook casing will either be plastic or aluminum. Plastic cases are great value for money on an already lower-costed product and aluminium is durable and light. Because of their minimalistic designs, Chromebooks as a whole offer longer a longer battery life. This is because they are designed to be ‘on the road’. Check to see that the machine's battery life meets your needs. This can vary widely from model to model, but battery life in hours is provided by manufacturers and should be listed in most product descriptions. Acer: Acer, a Taiwanese personal computer manufacturer, was the fourth largest PC vendor by units in 2013. 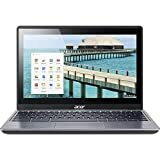 Acer believes in placing first priority on listening and satisfying customer needs, and then delivering first-class products and services and they have achieved this in laptops and chromebooks. Toshiba: Toshiba was founded in 1938 in Tokyo, Japan, and employed over 200,000 people in 2013. For over 135 years, Toshiba has been striving to make life more enjoyable with a full range of smart digital life products and consumer electronics, designed by the best and the brightest. They have carried this winning philosophy into their chromebook production. Samsung: Samsung began in 1938 as a Korean trading company, and by 2013 had $327b in global revenue. For over 70 years, Samsung has been dedicated to making a better world through diverse businesses and their flagship company, Samsung Electronics, leads the global market in high-tech electronics manufacturing and digital media which include the now popular chromebooks. HP: Hewlett-Packard Company, or HP, was founded in a one-car garage in Palo Alto, California, and has grown into one of the world’s leading PC manufacturers. Today they continue to drive product innovation in their core markets, with a focus on cloud, security, and big data to bring top rated laptops and chromebooks.